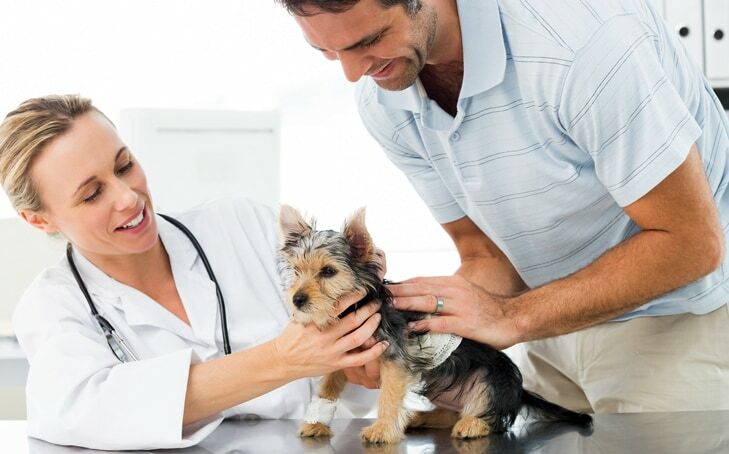 A growing number of clients are requesting alternative therapies for their pets, and more veterinarians are realizing that an animal clinic offering multiple approaches is not only benefiting the animals – it is also a natural way to grow their business. As a result, our role as Certified Veterinary Technicians (CVTs) is becoming increasingly important. As a veterinary technician, you can demonstrate the effectiveness of holistic modalities, increase revenue to the hospital, and even create your own business within the clinic. Ten years ago, I started working at a small animal clinic. The veterinarian I worked with offered alternative modalities. She practiced conventional medicine, but was also trained in Cranio Sacral Therapy (CST) and Nambudripad Allergy Elimination Techniques (NAET). I was able to speak freely about acupressure and other modalities, and we had a strong client base that specifically came to the clinic for these therapies. When I applied for a veterinary technician job at a specialty hospital four years later, the internal medicine doctor who was interviewing me saw that I was certified in equine and small animal acupressure, and requested I not tell clients about this modality. Over the past few years, however, there has been a distinct, though not complete, shift in perception at my hospital. When I started, I had to be a sort of “undercover acupressurist”. I used acupressure points during the sedation process to help animals transition more smoothly and quickly during the excitatory phase. In preparing a dog for an ultrasound procedure, I was able to reduce his anxiety by using specific calming points. Other veterinary technicians as well as the doctors began to notice and asked what I was doing. They became interested because they could see how effective the acupressure was. Nowadays, I have the opportunity to provide acupressure sessions for clients, as long as my other work is covered. 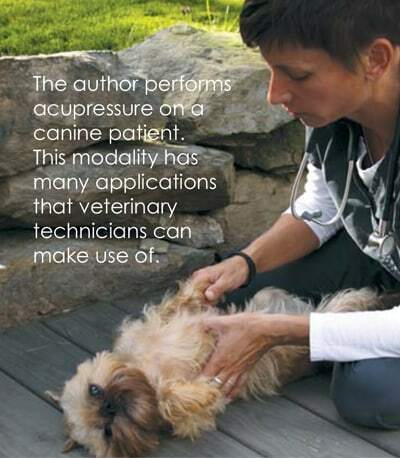 The doctors can see how acupressure helps the animals. After I worked with an allergic Airedale, for example, his medication dosage was decreased from six tablets twice a day to half a tablet twice a day. In another case, the doctors planned to place a Greyhound on numerous painkillers when she suffered a hip injury after falling down stairs. Two acupressure sessions later, the dog walked without a limp and was able to go up and down stairs again with no drugs. While every animal clinic is different, younger doctors seem more open to offering acupressure, rehabilitation, and other modalities, so these may be the ones to begin educating about the holistic skills you have. As time progresses, I’m seeing a change in thought that’s leading us toward the acceptance of a wider scope of medicine and a more integrative approach to veterinary care. Expanding CVT services can enhance patient health and clinic income. Although I’m seeing an increasing receptivity to acupressure and other complementary care possibilities, the owners of my practice are choosing not to charge clients for the additional service; hence, they are not paying me anything beyond my regular salary. Yet it would be ideal if I could offer an acupressure clinic within the practice. We see so many patients with acute issues such as broken legs, torn ACLs, and gastroenteritis; acupressure could assist in their recovery and the clients charged, possibly with a portion coming to me. Other patients dealing with chronic and terminal diseases such as kidney failure, cancer, congestive heart failure, and endocrine issues could receive a better quality of life, increased longevity, and comfort care through acupressure. Hospice care is increasingly requested by clients and these patients can benefit from many integrative modalities. Another possibility would be to have a separate or partner animal clinic to provide these services, through a financial agreement with the hospital. The practice laws governing what technicians can do are different in every state, so the legislation needs to be considered before presenting a plan to your hospital. Most hospice programs already offer veterinary technician house calls as part of the service, and being able to do acupressure and other modalities can be an added benefit. 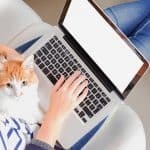 A brief internet search shows veterinary websites that list the holistic certifications of their technicians, but don’t mention acupressure and massage in the services offered. Changing this would increase traffic to the hospital as people Google “acupressure pet care”. Listing these options in the services dropdown menu, describing the modalities, and including case examples will also bring in new clients. Acupressure, like all modalities, can be individualized. Or, you can begin with points “for a condition”. The following are a few that seem to help a wide range of animals. 1. 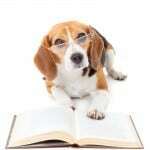 Anxious or stressed dogs: Ht 7 and Pe 7 (which can be worked together) and CV 17. My coworkers have even commented on how the patients’ eyes have softened while in the clinic. 2. Post op points: Bl 60, Ki 3, and Sp 21. LI 4, LI 11, St 36 and Sp 6. Ht 7, Liv 3 and Bl 18. 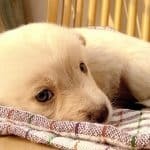 For more detailed instructions, also see our articles Canine Anxiety Acupressure Session and Internal Liver Wind and Seizure Disorders as well as our other articles on how to use acupressure to help your animals. Acupressure and other modalities also have much to offer animals during hospice care. There are acupressure points that can increase the patient’s quality of life, sometimes extend his life, or allow him to pass more easily and comfortably. 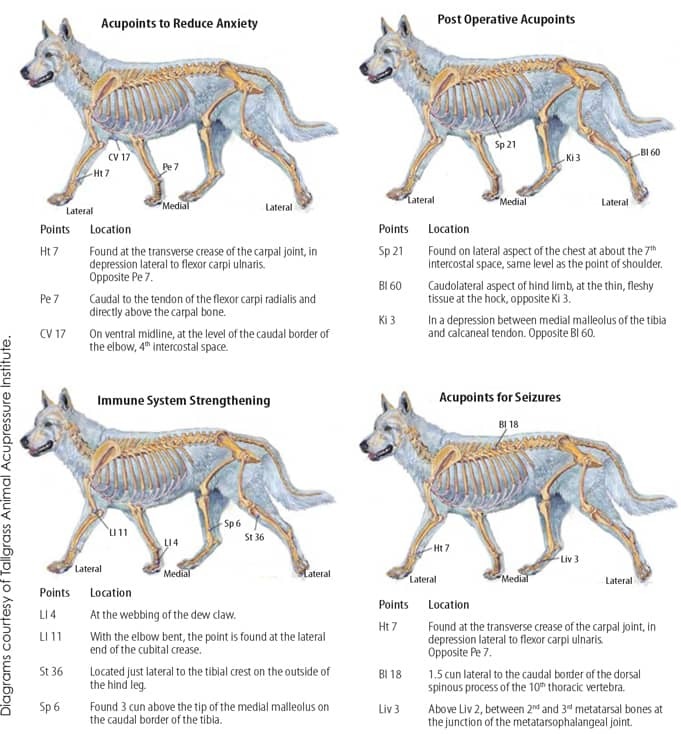 Some points are individually selected according to the symptoms and the animal’s unique characteristics, while others are more standard. In one example, a dog near death was having difficulty breathing, and the owner had stipulated “Do Not Resuscitate” (DNR). I gently applied two acupressure points and in less than 30 seconds, the dog’s breathing relaxed; he took two deep breaths and was gone. About the author: Jill Golgosky is a Tallgrass Acupressure practitioner and instructor, and a graduate of Kent State University with a degree in Zoology. For twelve years, Jill worked in the Aviculture department at Sea World in Ohio. In 2008, she became a registered veterinary technician and is currently employed in the internal medicine department at a specialty hospital. Jill graduated from Tallgrass Animal Acupressure Institute in 2009 and began her teaching career as a certified assistant, helping with classes at Hocking College for 5 years. She now teaches the Introduction to Animal Acupressure course for Tallgrass. Read all our articles on acupressure, and learn which points to work for various health issues in dogs, cats and horses.